Ask a senior to review if there are any two new acute onset posterior circulation symptoms (especially if there are risk factors for stroke) or any new focal posterior circulation neurological signs. *patient sitting on trolley, rapidly lowered to supine position with physician controlling head. Head rotated 45 degrees left then right. Burst of upbeat-torsional nystagmus, lasting < 30 seconds, triggered by the Dix-Hallpike test to one side. Unidirectional spontaneous (i.e., primary gaze) nystagmus, with ↑ in velocity in the direction of the nystagmus fast phase and ↓ velocity in the opposite direction. E.g. left beating nystagmus in primary gaze, with an increase in velocity with left gaze, and a decrease (but not reversal) with right gaze. Spontaneous vertical nystagmus (upbeat or downbeat). Gaze-evoked direction changing nystagmus (i.e., persistent left beating on left gaze and then persistent right beating on right gaze). Persistent down-beating nystagmus triggered by a positional test such as the Dix-Hallpike test. *For peripheral vestibular nystagmus, the velocity of nystagmus typically increases by inhibiting visual fixation and decreases by encouraging visual fixation. However, the effect of visual fixation does not discriminate one peripheral vestibular disorder from another. § The Dix-Hallpike test is a specific positional test to asses for positional nystagmus. The patient sits upright and the head is turned about 45° to one side. The patient is then quickly guided by the physician down to a supine position with the head extended over the end of the examining table. In this position, the eyes are observed for nystagmus triggered by the test. 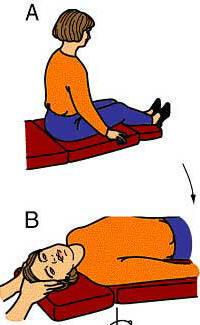 The patient is then brought back to the sitting position and the test is then repeated with the head turned to the opposite side. HINTS to try differentiate benign AVS from posterior circulation stroke. Used to check for proper vestibular ocular reflex (VOR) function. Check for nystagmus - involuntary, rapid and repetitive movement of the eyes. Most patients who present an AVS show a dominantly horizontal uniditectional (direction of nystagmus unaffected by changed in gaze direction) nystagmus, which beats only in one direction and increases in intensity when the patient looks in the direction of the nystagmus fast phase (AWAY from the offending labyrinth). Patients with a central AVS will sometimes exhibit a change in the direction of eccentric gaze. A vertical ocular misalignment which results from an imbalance in neural firing when there is a central stroke/lesion. Cover, then rapidly uncover one eye. and indicates no immediate brain imaging is required. and indicated further imaging is required. The HINTS exam is more sensitive and specific than general neurological signs or than MRI in detecting medullary/pontine stroke. Unilateral sensorineural loss needs tumour exclusion (ENT OPD). The whisper test with finger-rub distraction should be followed up with Rinne's and Weber's to establish basis of hearing deficit. Suppurative labyrinthitis - from recurrent otitis media / mastoiditis etc.